Once you’ve decided to supplement your diet or exercise regimen with whey protein, your decision is only half done. You still have to choose a brand and type of whey protein powder that will most benefit you. Of course, you’ll want something that will help you reach your goal, whether it’s to build muscle, to lose weight, or to maintain optimal health. Why does the type of whey protein powder even matter? Most companies are more concerned with quantity than quality. This means that they care more about selling a lot than about providing a high quality protein supplement. And if you’re not using a high quality protein powder, then you’re missing out on a lot of health benefits. This can be expensive! It takes a lot of time to sort through all the options to find the best ones, so I’m sharing what I’ve found in the hopes that it will save you time and money while helping you increase your health and fitness. WHAT DO YOU GAIN FROM USING A HIGH QUALITY WHEY PROTEIN POWDER? HOW DO YOU KNOW WHEN YOU’VE FOUND A HIGH-QUALIT – WHEY PROTEIN? Cows evolved to eat grass, not corn or other grains. So cows who are allowed to eat grass enjoy better health and produce better food products, including whey protein. Grass-fed whey protein contains more of the valuable enzymes, nutrients, and amino acids that our bodies crave. Traditionally, farmers are paid for producing lots of food, regardless of quality. They use shortcuts whenever they can — that’s just business. Unfortunately for us, these shortcuts often sacrifice nutrients that our bodies need. Bovine growth hormone, often listed as rBGH, is used to make cows grow more quickly. An increased rate of growth without an appropriate increase in quantity or quality of diet results in malnourished, sick cows. So, the cows are given antibiotics to prevent and cure illness. Even some grass-fed cows ingest pesticides because farmers rely on the pesticides to keep the grass healthy enough to be eaten. The problem with these business practices is that those artificial chemicals — growth hormones, antibiotics, and pesticides — end up in every single food product derived from those cows, including whey protein powder. Some of these chemicals could sabotage your efforts to increase health and fitness, and some of them could outright harm you. Either way, they’re simply not natural. And if it’s not natural, it doesn’t belong in your system. In the world of proteins, denatured — pronounced “dee-NAY-tured” — means that the protein has been physically bent into a different shape that renders it ineffective. This can be caused by extreme heat or exposure to certain chemicals such as acids. In the food supplement industry, most companies use extreme heat or acids to produce whey protein because it’s quicker and cheaper. But the end result is a protein that can’t even do anything in your body because it’s already dead. To avoid this problem, look for undenatured whey protein. These protein powders are cold processed, meaning they’re processed using temperatures that are too low to hurt the enzymes, vitamins, and proteins. These nutrients stay biologically active and are ready for your body to use as soon as they’re digested. The more natural the food source, the healthier for your body. The more additives a food contains, the more it could harm your body. And many of the food additives used today were invented in a laboratory — they don’t even exist in nature! Why fill your body with artificial chemicals when the real thing is better? Besides, natural foods taste better anyway! If you’re looking for a variety of flavors, try making whey protein smoothie with different organic fruits or vegetables such as squash, broccoli, garlic, okra, or asparagus. These nutrient-rich foods can only add to your health. WHICH WHEY PROTEIN DO YOU USE? Personally, I like the EnergyFirst Whey Protein Powder (which happens to be our winner for best protein powder of 2018). Why? Of all the known natural sources of protein, this has the most biologically active nutrients. It’s a whey protein isolate that comes from 100% grass-fed cows and that is cold-processed. It contains a ton of all the essential amino acids that the human body needs, so it offers a great, natural meal replacement. It doesn’t contain any growth hormones or pesticides, and it’s sweetened with all-natural stevia instead of artificial chemicals. In fact, every single ingredient in this protein powder is natural and pure. It has zero fat, lactose, cholesterol, and sugar. It only has pure whey protein, which is exactly what I want. It’s made with the latest technology, cross-flow microfiltration processing. This makes sure that the whey protein is the highest possible quality and strength from the first serving to the last. 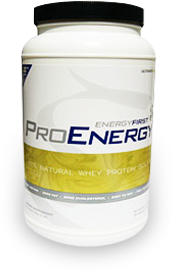 Energy First Whey Protein Powder has the highest biological value of any known naturally occurring protein source. It is 100% pure grass fed undenatured (cold-processed) whey protein isolate (not concentrate). Contains all 8 essential amino acids that your body needs making it a perfect all natural meal at a great price. Is 100% pure whey protein isolate (not concentrate) from healthy grass fed cows. Uses only 100% natural ingredients in their purest, most powerful form to give you the utmost benefit. Created using the most scientifically advanced cross-flow microfiltration processing technique available in the world to ensure you get the highest quality, highest potency whey protein in each and every serving. Contains no fat, no lactose, no cholesterol, and no sugar…just pure healthy whey protein. Is the perfect fuel for building lean, strong muscle.